In Part I of this Putlizer-worthy series on the AP Poll, we looked at the preseason poll from the last twelve seasons. 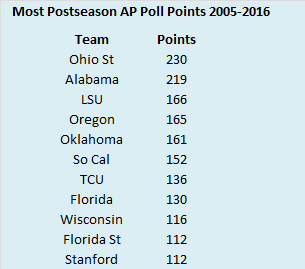 This time out, we will examine twelve years’ worth of data on the final AP Poll. The methodology will be the same. The team that finishes ranked first will receive 25 Postseason AP Poll Points (POAPPP, yeah the acronym could probably use some work), the team ranked second will receive 24, and so on until we come to the 25th ranked team which will receive a single point. While the preseason poll is based on expectations and pedigree, the postseason poll is based on performance. Certainly, some biases still exist. A ten-win Texas will probably be ranked ahead of a ten-win Vanderbilt all else being equal, but performance instead of reputation should account for most of the position in the final poll. Once again, only current Power Five teams are included. 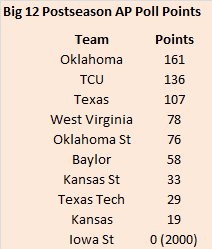 Without further ado, here are the top ten teams in POAPPP since 2005. The top spot is a little surprising to me. 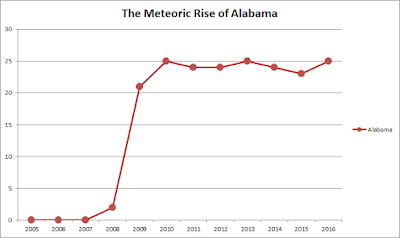 I expected Alabama to have a stranglehold on the top spot with four championships in the past twelve seasons, but Ohio State’s dependability wins the day. Eight schools have won national titles in the past twelve seasons and five are represented here. Auburn, Clemson, and Texas are the three champs that have not been consistent enough to break into the top ten. TCU, Stanford, and Wisconsin are the lone top-ten teams to have not won or played in the national championship game since 2005. Unlike the preseason poll, no team has appeared in every iteration of the final poll. Twelve teams have appeared in at least eight editions of the poll. They are listed below, ordered by number of appearances. Ohio State missed out on an appearance in the final poll in the bridge year between Jim Tressel and Urban Meyer. They have finished ranked eleven times, with ten of those finishes coming in the top-ten. Alabama, LSU, Oklahoma, and Oregon should not surprise anyone with ten ranked finishes, but Wisconsin showing up with the same amount was shocking to me. 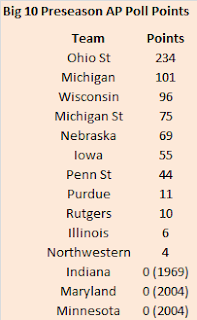 Next, I thought it would be useful to compare the POAPPP by conference. This will tell us which school have had the most success in their respective leagues. We’ll start with the ACC. Not much of a surprise at the top of the ACC standings. 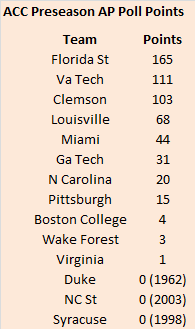 Florida State and Clemson have won one national title apiece in the last five years, and along with Virginia Tech, those three teams have combined for 15 of the 24 available slots in the twelve ACC Championship Games. Last week, I forgot to include Notre Dame in the rankings since they were the only Independent school. They are listed here for simplicity’s sake. Look how low Miami ranks in this metric. 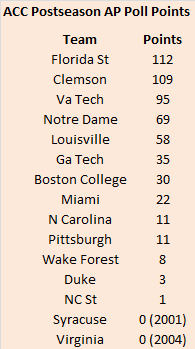 Hail Mary by Doug Flutie aside, Miami should not rank below Boston College over an extended period of time. Syracuse and Virginia have not finished in the final poll in this time period, but they both finished ranked relatively recently. Much like they did with the preseason poll, the Buckeyes have also dominated in postseason achievement. Ohio State has more POAPPP than the second and third place Big 10 teams combined. It’s interesting that Wisconsin and Michigan State occupy second and third in place of more traditional powers Penn State and Michigan. The Nittany Lions and Wolverines appear to back on the upswing, but both have a ways to go to catch Wisconsin. Elsewhere in the rankings, take a look at Nebraska. 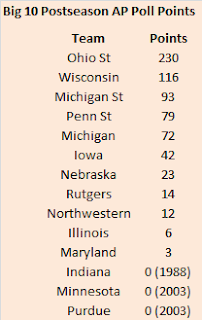 Somewhere Tommie Frazier is probably rolling over defenders at the thought of the Cornhuskers barely having more POAPPP than Rutgers (keep in mind this does include points Nebraska accumulated while a Big 12 member). 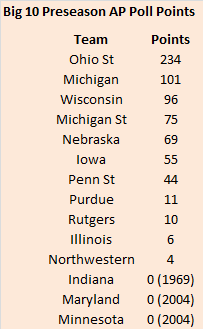 Indiana has the distinction of being the lone current Big 10 team to not finish ranked since the turn of the century. In a bit of an upset, TCU and not Texas, finishes second in the Big 12. In fact, the Horned Frogs are closer to Oklahoma than Texas is them. 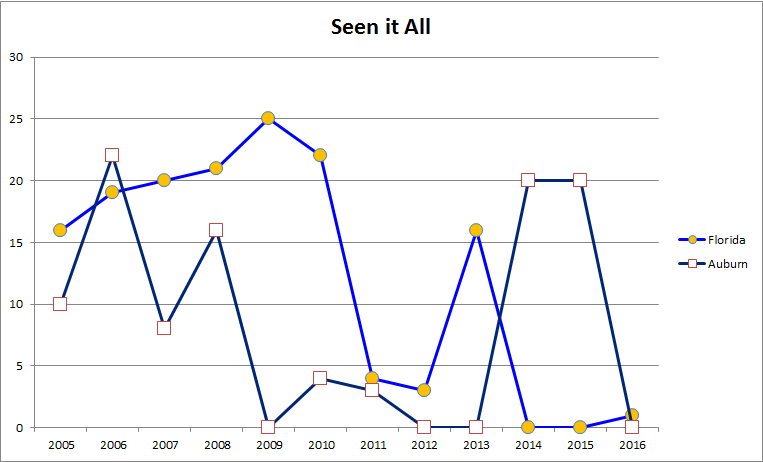 Toward the bottom of the list, Kansas has only finished ranked once since 2005, but they made the most of their outlier year, finishing seventh. The Jayhawks are the only Power 5 team with just one ranked finish in that time period to end up in the top-ten of the final poll. 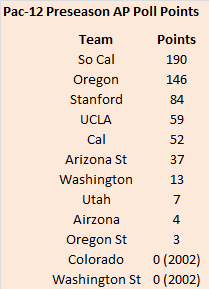 The top of the Pac-12 is not very surprising, but it is interesting that Oregon was able to pass Southern Cal for the top spot. Stanford spotted the rest of the conference a half-decade head start, finishing outside the polls until 2010, but has racked up more than 100 POAPPP over the past seven years. The fact that Utah is ranked fourth is an indictment of the rest of the conference. Utah was a (quality) mid-major for half of the twelve-year time period, but no other mid-level Pac-10/12 squad (UCLA, Arizona State, Washington) managed to eclipse their POAPPP. Washington State finished ranked in the top-ten three consecutive years (2001-2003), but turned to dust just before the time period featured here. 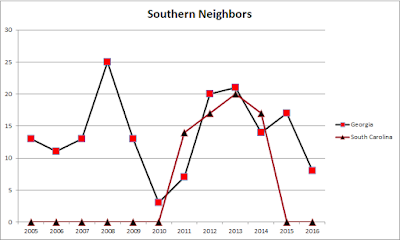 Alabama endured back-to-back 6-6 regular seasons (otherwise known as reasons for celebration at Vanderbilt) in 2006 and 2007, but have otherwise dominated the SEC during this time period. LSU is a distant second with Florida and Georgia also eclipsing the 100 point threshold. 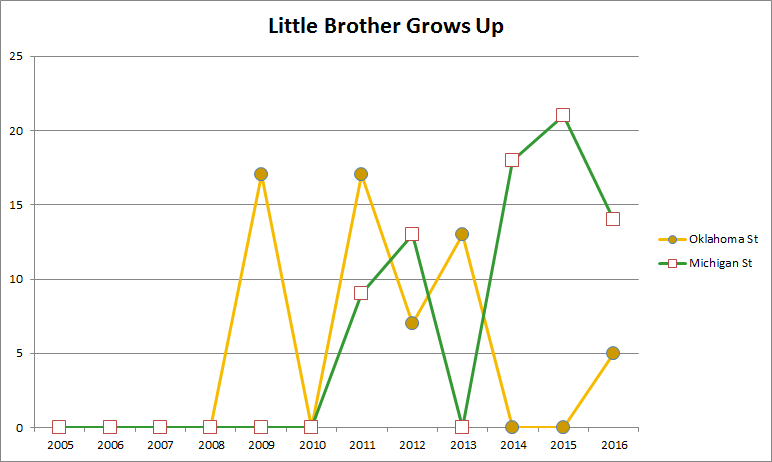 This chart shows why Tennessee has had to resort to ‘champions of life’ as they have bested only Vanderbilt and Kentucky in terms of POAPPP since 2005. Speaking of Kentucky, the Wildcats hold the ignominious distinction of being the current Power 5 team that finished ranked longest ago. Another poll post has come and gone. If you think about it for a second you can probably guess where I’m headed next. That’s right, in the next post we’ll look at which teams have the biggest differences (positive and negative) between their preseason and postseason rankings. Basically, who exceeds expectations and who fails to live up to the hype. You can do the math yourself from the last two posts or wait for me lay it out for you. Either way, thanks for reading. Stay tuned. The preseason AP Poll gives us a look into how college football teams are regarded by the national media. It sets an expectation for what will occur in the coming year. 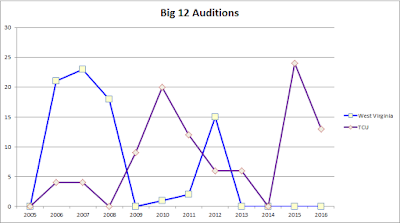 Voters base their selections on things like performance the previous season, returning production, staff changes, recruiting, and a host of other criteria specific to each individual. Over time, a team’s standing in the preseason poll is the amount of respect they have or their pedigree. Which teams have the best pedigree over the last decade or so? To answer that question, I developed a simple system for rating teams based on their position in the preseason AP Poll. 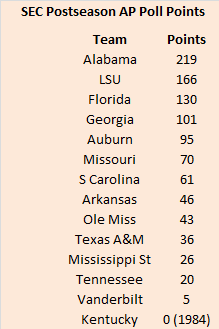 In a bit of creative inspiration, I called my metric Preseason AP Poll Points or PRAPPP. The way it works is simple: the top-ranked team in the preseason AP Poll receives 25 PRAPPP, the second ranked team receives 24 PRAPPP, and so on with the 25th ranked team receiving a solitary PRAPPP. I decided to look at PRAPPP dating back to 2005 for current Power Five teams. 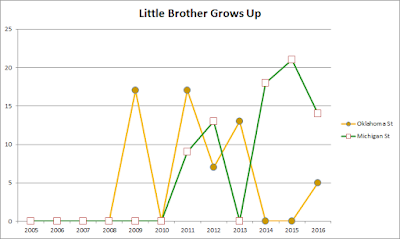 I used 2005 as a starting point for several reasons. 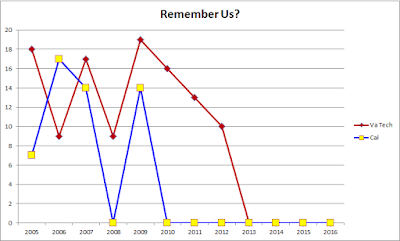 2005 is when the ‘Realignment Era’ began in earnest and it also happens to be when I started this blog and began paying very close attention to college football. I looked at current Power Five teams because the only current mid-majors consistently in the preseason poll are Boise State and BYU. With the backstory out of the way, here are the top ten teams in PRAPPP since 2005. No big surprise here. If I asked you to guess the teams with the most PRAPPP, you probably would have come up with at least seven of the top ten. These ten teams have all won or played for a national championship since 2005 with one exception. Since 2005, five teams have appeared in each iteration of the preseason AP Poll. I bet you can guess four of them, but the fifth may surprise you. 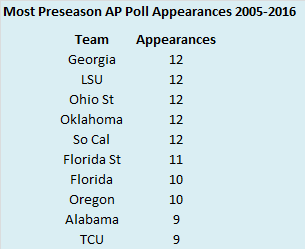 Anyway, here are the teams with the most preseason AP Poll appearances since 2005. Georgia, along with LSU, Ohio State, Oklahoma, and Southern Cal has been ranked in the preseason AP Poll each season since 2005. Once again, the Bulldogs are the only team without a championship game appearance in that span. I was surprised that TCU has the same number of preseason appearances as Alabama, but the Horned Frogs were one of the most respected mid-majors before joining the Big 12 conference. Next, I thought it would be useful to compare PRAPPP by conference. This can give us an idea of which teams are the most well-regarded in their respective leagues. We’ll start with the ACC (this includes current ACC teams and the PRAPPP they have generated regardless of the conference they occupied at the time). 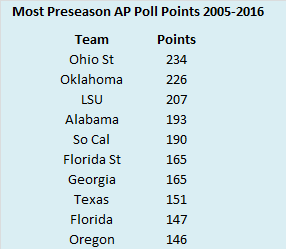 For teams that have not appeared in the preseason AP Poll in the last twelve seasons, their last appearance is included in parentheses. The Seminoles, even when they were busy failing to live up to expectations, were a fixture in the preseason poll. 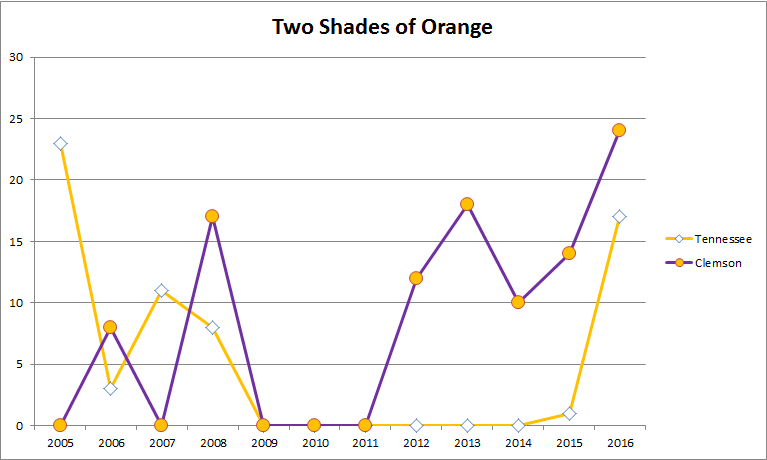 Virginia Tech finishing second is somewhat surprising, but remember Clemson’s run of national relevancy is relatively recent. This cumulative ranking also demonstrates how far Miami has slipped in the conference pecking order (of course that may change in the coming years with Richt in charge). Finally, as a Wake Forest alum, it gives me great pleasure to note the Demon Deacons have more PRAPPP since 2005 than NC State. While the ACC had a more egalitarian top-three with Florida State, Virginia Tech, and Clemson bunched at the top, Ohio State is head and shoulders above the rest of the Big 10. Their total is more than that of Michigan and Wisconsin combined. 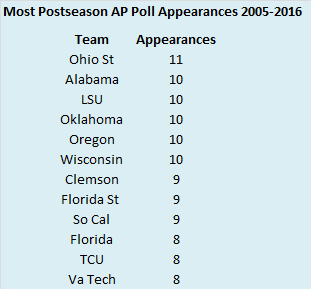 I was surprised by Penn State’s low ranking on this list considering they have played in three Rose Bowls since the 2005 season. This list also shows that Purdue was once good at football not that long ago and even lowly Rutgers has been ranked in the preseason poll. Oklahoma and Texas at the top of the standings? Who would have thought? The newcomers, TCU and West Virginia, rank third and fourth, but it should be noted they accumulated most of those PRAPPPs as members of other conferences. Down near the bottom of the list, remember Kansas was ranked in the preseason poll for two straight years! To me, the biggest surprise here is Cal. Remember when they were a nationally respected program under Jeff Tedford? I was also surprised at the lack of national support Utah seems to get despite consistent success in the Mountain West, their memorable Sugar Bowl win over Alabama, and solid play since joining the Pac-12. 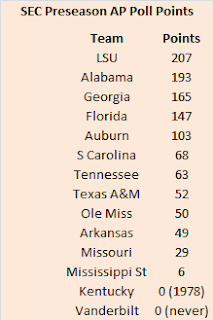 No other conference had more than three teams with a PRAPPP of greater than 100, but the SEC produced five such schools. I was surprised South Carolina ranked ahead of other teams like Tennessee and Texas A&M. Missouri seems to be chronically disrespected by the national media as they have four conference title game appearances since 2005, but just 29 PRAPPP (and no conference titles). 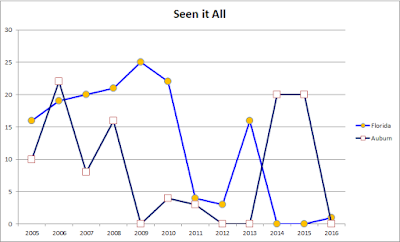 I wanted to do a chart for each conference showing how PRAPPP changed over time for each team, but with ten to fourteen teams included, the charts were hard to read and not very valuable. 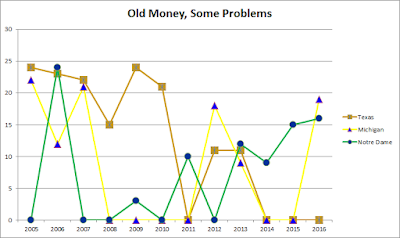 I still wanted to show some trends, so I made a few charts with no more than three teams and have included them here. 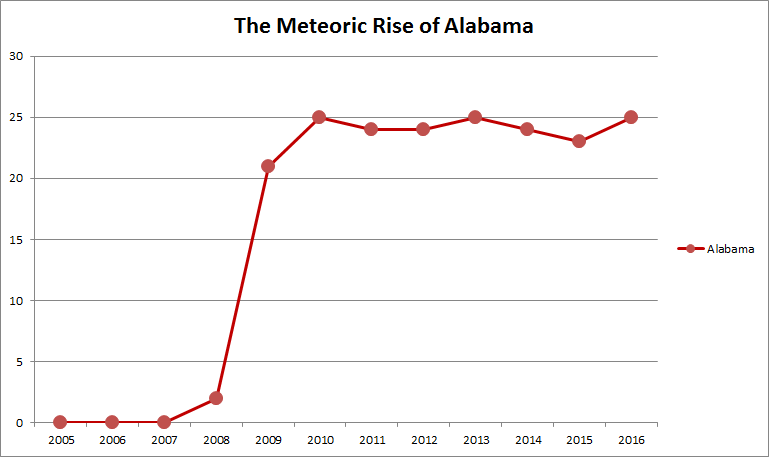 This pretty much sums up the Alabama football program over the last decade. 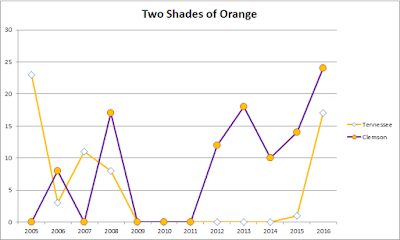 The Tide were an afterthought from 2005-2007 (they did win ten games in 2005, but were not in the preseason poll after a mediocre 2004), but after demolishing Clemson to open the 2008 season amid modest expectations, the Tide have pretty much cornered the market on PRAPPP. 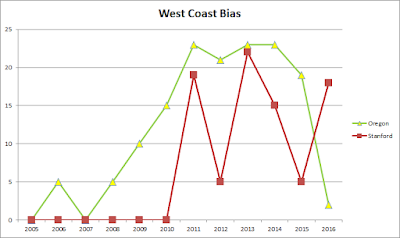 Since 2009, the Tide have garnered 191 of a max 200 PRAPPP. 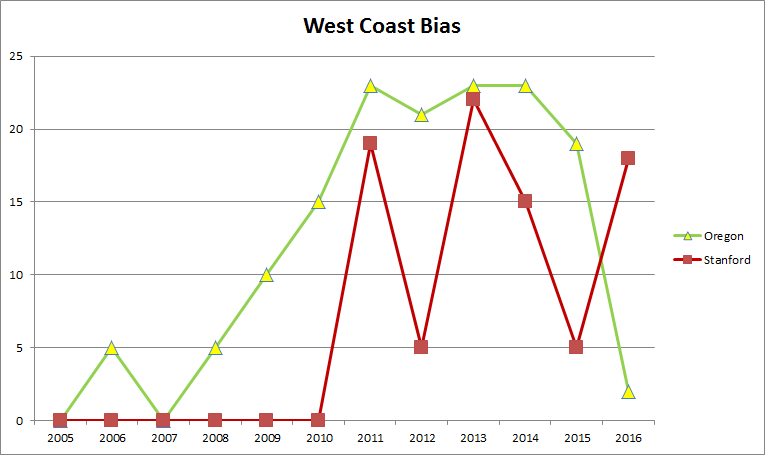 Out west, you can see when Oregon became a legitimate national title contender. 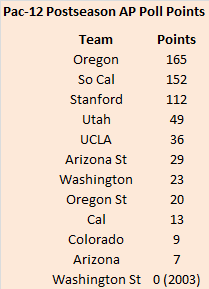 After being a fringe preseason top-25 team, the Ducks have been a consistent occupant of the top-ten since 2010. Perhaps Willie Taggart can bring them back after a blip in 2016. Down in Palo Alto, Jim Harbaugh did all the heavy lifting after Walt Harris ran the program into the ground. However, David Shaw has maintained the foundation Harbaugh built and kept the Cardinal consistently in the preseason top-25 and occasionally the top-ten. 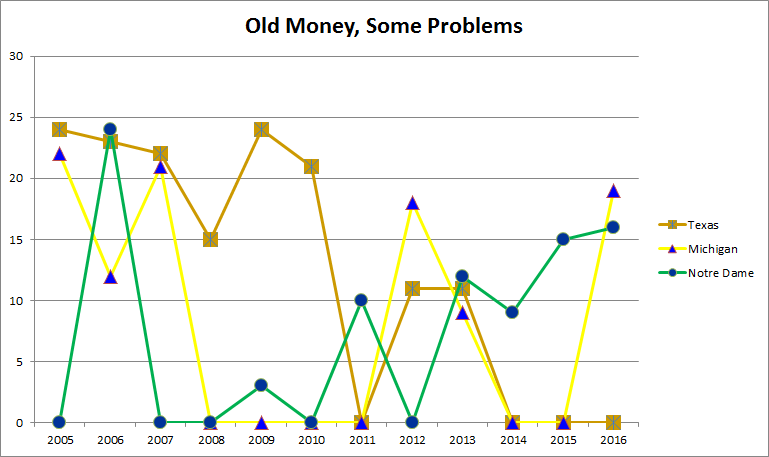 These three ‘old money’ programs have seen their share of ups and downs. Texas was a regular tenant in the preseason top-ten, until 2010, but the Longhorns have been ranked in the preseason just twice in the past six years. Michigan crashed and burned under Rich Rodriguez, rose for a moment under Brady Hoke before falling again, and now may finally be back on track under Jim Harbaugh. Notre Dame went from an unranked start under Charlie Weiss to being ranked second in the preseason poll in his second season. Notre Dame has been steadier in regards to preseason ranking under Brian Kelly, but in their best season (2012), they were unranked in the preseason poll. Tennessee began Philip Fulmer’s final season in the preseason AP Poll, but it would be seven years before they would start a season ranked again. Meanwhile, Clemson was notoriously unpredictable under Tommy Bowden, alternating unranked and ranked starts in his final four seasons. It took Dabo Swinney some time to get the program on firm footing, but the Tigers have been in the preseason poll each of the last five seasons. Two schools with more famous in-state rivals have seen their profiles rise dramatically under long-tenured coaches. Mike Gundy has seen Oklahoma State ranked in the preseason AP Poll five times in the past eight seasons while Michigan State has been ranked five times in the past six. Back in George W. Bush’s second term, Cal and Virginia Tech were consistently respected programs. Cal saw their respect erode when the decade tuned, while Virginia Tech continued to be held in high esteem for another three years. The Hokies will probably break their streak of unranked starts in 2017. Florida and Auburn have seen almost everything. The Gators and Tigers have combined for three national titles, seven division championships, four SEC championships, and three losing seasons since 2005. Despite the recent division titles for Florida, you can see the Gators are still not nearly as respected as they were a few seasons ago. 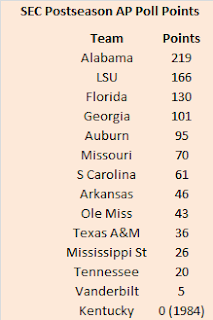 For Auburn, the results are more scattershot, with the Tigers sandwiching top-ten starts between unranked beginnings since Gus Malzahn took over. Georgia has surprisingly been in every preseason poll since 2005, but the national media has only regarded the Bulldogs as elite a few times (just four preseason top ten starts). You can see South Carolina’s brief time as a nationally respected program which was undone after their face planting as a preseason top-ten team in 2014. After beginning the year in the AP Poll five times in seven years, West Virginia has started the year as a ranked team just once since joining the Big 12. 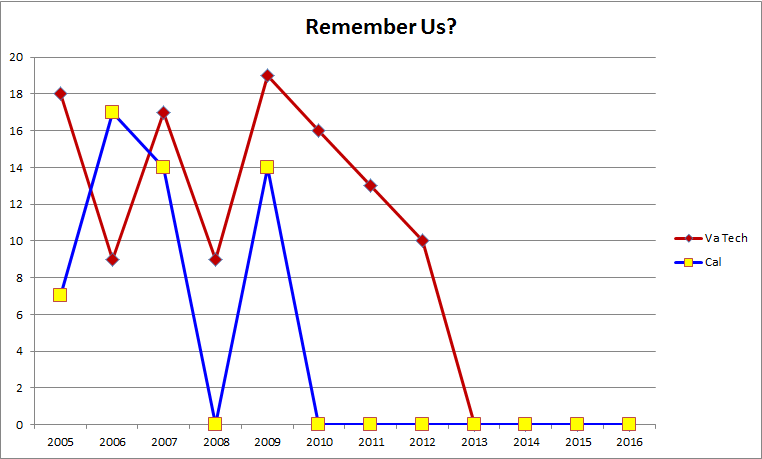 Pollsters appear to be scared off after the 2012 debacle that saw West Virginia climb all the way to number three before losing six of their last eight games. 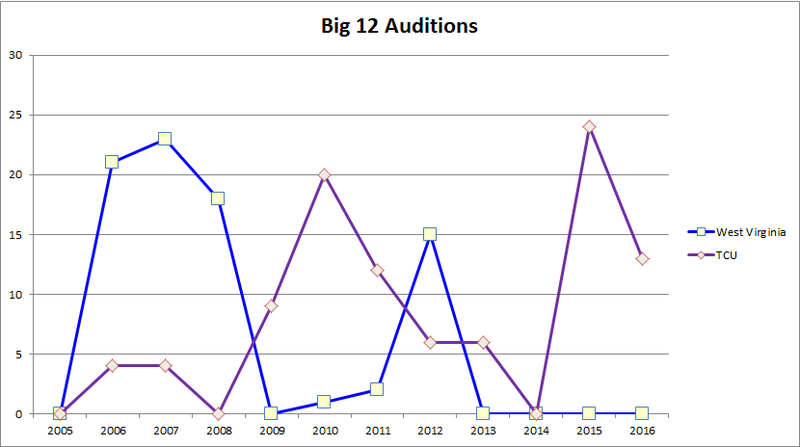 Pollsters have shown more deference to TCU despite a few disappointing seasons since joining the Big 12. This concludes our look at PRAPPP. Thankfully, the AP also conducts a poll when the season is over (and every week throughout the year). While the preseason poll is about expectations and reputation, the postseason poll should be about results and achievement. 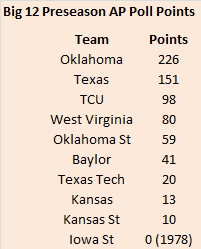 In the next post, we’ll look at how Power Five teams stack up in regards to the postseason AP Poll. Stay tuned.